Beranda » China Glaze » Pure Ice » She Cracks Me Up! I was getting my hair done months ago and the receptionist at the salon had the cutest mani despite the fact they were chipping I loved the color combo. She had a bone color as the base and then she had a mint green crackle which reminded me of China Glaze's For Audrey. So last week while looking for a edgy Spring combo I came upon my "For Audrey" (which I hadn't tried out yet) and the Cracked Concrete by China Glaze. Firstly I love the formulation of For Audrey and many say it is a dup of Ulta's "Mint Condition". They would be correct except for the fact of how BEAUTIFUL "For Audrey" goes on. Definitely one of my favorites now. 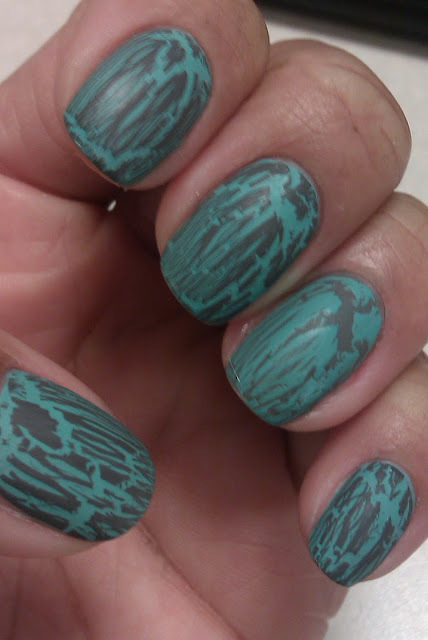 On the ring finger I inverted the colors and used Pure Ice's "Kiss me There" and China Glaze "Crushed Candy" for the crackle. 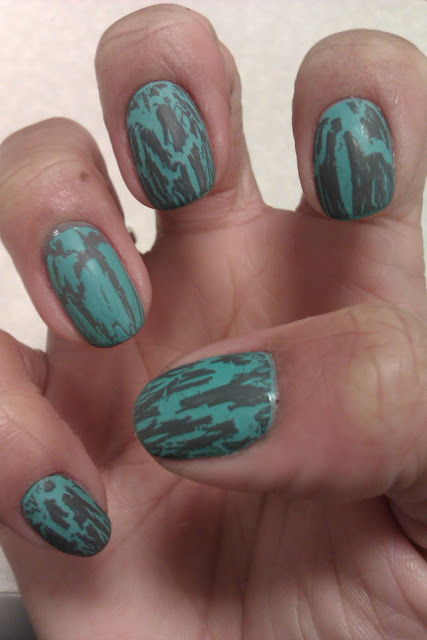 Then I mattified the whole look with Hard Candy's mattifying topcoat. I called this mani She Cracks Me Up as a play on "For Audrey" and the crackle. Thoughts? Feelings? Concerns? With flash above without below to showcase the matte effect. I need to learn how to work my camera better. Sorry for the haze.